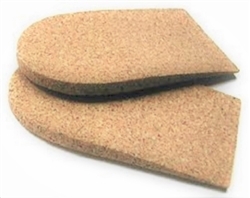 natural rubber cork base heel lift. used for limb length discrepancy, low back pain and sciatic pain. Glad I found this 1/2 inch (12mm) cork heel lift. They are hard to find. Atlas biomechanics' cork heel lift not only comes in 12mm ( 1/2") but are of high quality and a good price. Been using them for my post-op hip and knee replacement patients with a limb length unequality.